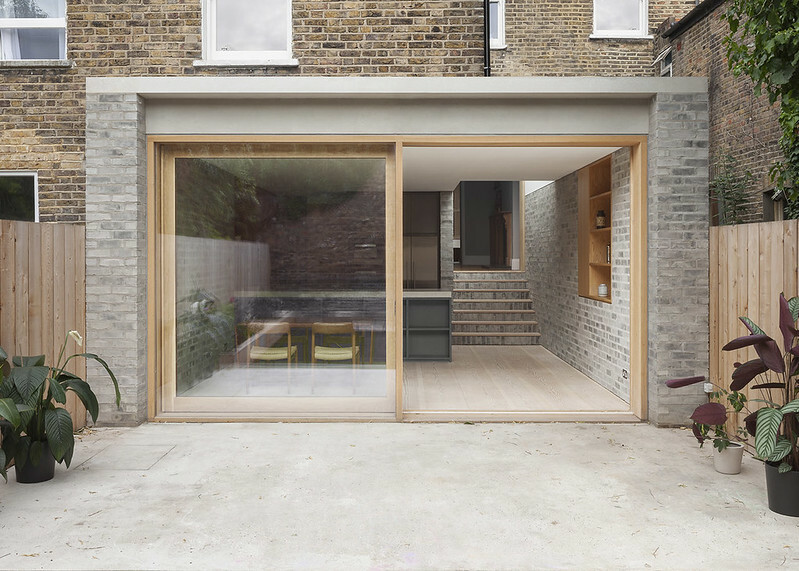 A single-storey L shaped one-room extension to a Victorian terrace in Stoke Newington, distinguished by careful detailing and a simple material palette of exposed brickwork, timber and concrete. This project is for a single storey L-shaped extension that infills the narrow passage to the side of the rear outrigger part of the house and integrates the existing ground floor to create a new large kitchen and dining area overlooking the garden. The existing kitchen was narrow and dark with its connection to the garden obstructed by a small utility annex. The design approach was to provide a large singular space, distinguished by careful detailing and a simple material palette of exposed brickwork, timber and concrete. Grey brick walls run the length of the space, and their substantial depth enables structural steelwork and oak joinery pieces to be embedded within them. The extension also negotiates a significant level change from the main house, using a top lit connection to provide head-height over a new brick stair and flood the centre of the house with light. Externally a bespoke precast concrete lintel spans across the brick walls and frames a full width oak sliding window, designed and made especially for this project. In situ concrete is also used in the kitchen for the work surfaces, alongside valchromat and oak for the kitchen cabinets and other storage elements.